Istanbul was Constantinople; We are not banned. The Today Show with Matt Lauer was here last week. Now it is our turn. This is where Europe meets Asia. The Bosphorus is the vital waterway linking the Black Sea to the Mediterranean. 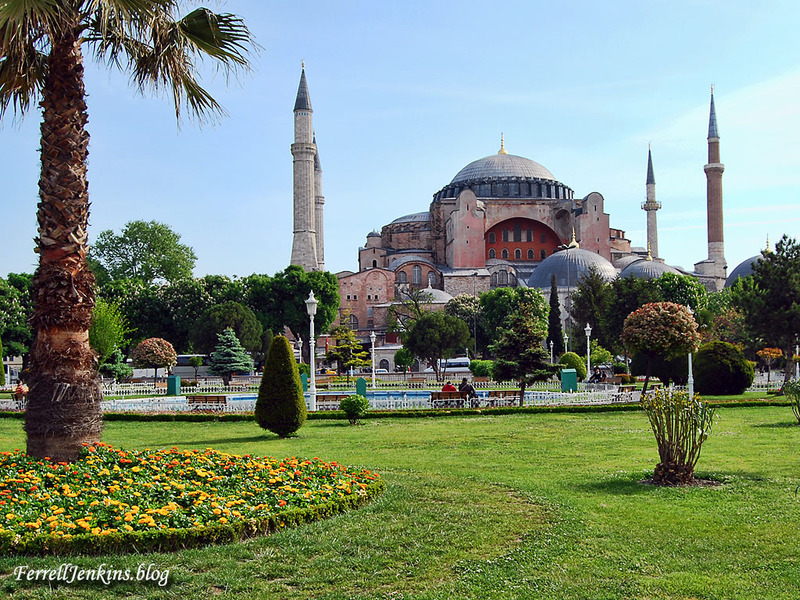 We plan to visit the Blue Mosque, the Hagia Sophia, and the Topkapi Palace with its priceless jewels. Our visit also includes the Istanbul Archaeological Museum which houses numerous discoveries of biblical interest. Everyone should visit the Grand Bazaar at least once. The bazaar is made up of more than 4,000 little shops under one roof. Everything from cheap trinkets to expensive jewelry and carpets may be found in the bazaar. Here is a photo of the famous Hagai Sophia. This structure was built by the Emperor Justinian as a church between 532 and 537 A.D. Later it was converted to a mosque, and in now a museum. It is one of Istanbul’s most famous landmarks. Hagai Sophia in Istanbul, formerly Constantinople. Photo by Ferrell Jenkins. Let’s not forget that Constantinople was Byzantium. On time arrival. We arrived safely in Istanbul this afternoon to beautiful weather. A few members of our group had come to the country early (as much as two weeks) to enjoy the sites. Others used their frequent flyer points. Everyone is here, and there is no lost luggage. We are not banned. Perhaps the ban on WordPress has been lifted. I logged in with no problem. We hope this will continue to be true. Let us hear by Email if you have any difficult accessing the page. Use this Email address: fjtours [at] gmail [dot] com. The 5 p.m. call to prayer just started (by loud speaker) at a nearby mosque. It reminds us where we are.